On Saturday, November 29th, I received an e-mail announcing that registrations for the 2018 OpenSimulator Community Conference are open. The 2018 conference will take place on Saturday 8th and Sunday 9th December 2018, celebrating 11 years of community and development of OpenSimulator and focusing on the evolution and future of this open-source virtual world platform. Attendance is free, but numbers are limited. Those wishing to donate to the supporting this and future conferences, can do so through a number of donation options, ranging from $10.00 USD through to $200.00 USD, or donate an amount of their own choosing, all of which offer various benefits to purchasers, such as reserved seating areas expo booths at the event, physical t-shirts and other OSCC18 promo items. The expo area associated with the conference will not be ticketed and so can be accessed by any avatar, subject to constraints on the number of avatars that the exhibition regions can hold at any particular time. To book your tickets to attend the conference through your avatar, and to see the full range of ticket options and their respective benefits, please visit the conference ticket page. Note that registration is open on a first-come-first-served basis until the maximum number of virtual conference centre tickets is reached. At that point, community members will still be able to register for the live streamed version of the conference that will be available. OSCC 2018 is still accepting registrations from volunteers to help run the event, and from those interested in hosting a social event associated with the conference. The conference needs volunteers to help in a range of activities: greeters / audience assistants ; moderators; builders; scripters; social media / communications; streaming and technical support. Those interested in volunteering can do so via the Volunteer Sign-up form, Depending upon interests, volunteers can select more than one role if they wish. Social events can be held on other grids, and can be scheduled on dates leading up to the conference on Saturday, December 8th, 2018, or for after 17:00 PDT on either Saturday, December 8th or Sunday December 9th, 2018. Those wishing to host an event are asked to complete the Social Event Sign-up form. There will also be limited available space on the OSCC conference grid for those who would like to host an OSCC meet-up or after conference event on Sunday, December 9th, 2018. Please contact the organisers with questions. We are looking for artists to Contribute art with us to showcase and to freely share with the community. These artworks will be placed on our Landing Regions and Expo Regions and possibly in the Keynote Regions. We will encourage participants to tour the artworks and make those that are either Public Domain Dedication or Creative Commons Attribution available for OSCC attendees to pick up a copy for their own regions. All art must fit a 5m x 5m x 7.5m (height) area. Mesh must not exceed 25K polygon counts. Art must be distributable by Copy or by box, and must be resource considerate. No timers, scanning or logos permitted. Artists wishing to participate are asked to e-mail opensim@avacon.org, and include a photo or sketch, description, and any other details about the work they would like to submit. The 2018 OpenSimulator Community Conference (OSCC) will take place on Saturday 8th and Sunday 9th December 2018. An annual conference that focuses on the developer and user community creating the OpenSimulator software. Organised as a joint production by Core Developers of OpenSimulator and AvaCon, Inc., with major sponsors including the University of California, Irvine, Institute for Virtual Environments and Computer Games and the Rockcliffe University Consortium. The Conference for 2018 will feature a series of dynamic short presentations and panels that spotlight the best of the OpenSimulator platform and community, and a Call for Proposals has been issued to individuals or groups who are shaping the Metaverse. 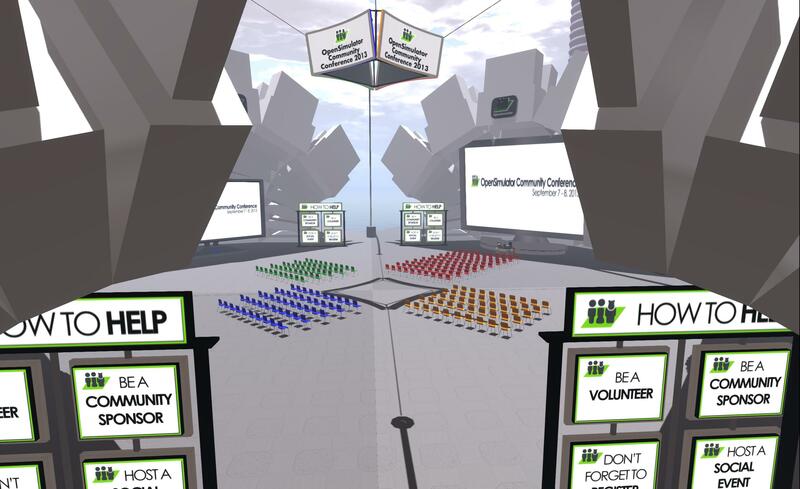 The speaker sessions offer 20-minute presentations to engage the mind while the community-sponsored tours, and on the Expo regions, content give-aways and Hypergrid explorations take attendees to faraway places. We are particularly interested in speakers who dramatically tell the story of their work and employ great 3D examples as props and graphics. In particular, the organisers encourage presentations that span current innovations and activities, performance artistry, educational simulations, innovative business cases or have a publication or track record of real world use. Those wishing o submit a proposal, please complete the proposal application form. If you have questions or need more information, please contact the conference organisers. October 22nd, 2018 – Proposals are due by 11:59 PM PST (Pacific Standard Time). October 29th, 2018 – Proposal acceptance emails and with conference information. November 3rd, 2018 – Accepted speakers must register for the conference to create an entry in the conference schedule and the program. November 10th, 2018 – Speaker Orientation & Training sessions and Presenter Booth Setup to prepare speakers for the conference. November 17th, 2018 – Deadline for stage props and audio-visuals (beyond textures) for conference program. December 8-9th, 2018 – OSCC18 Conference dates. Those interested in volunteering can do so via the Volunteer Sign-up form, Depending upon interests, volunteers can select more than one role if they wish. The 2016 OpenSimulator Community Conference is in progress over the weekend of December 10th / 11th. An annual event, the conference focuses on the developer and user community creating the OpenSimulator software. It is organised as a joint production by Core Developers of OpenSimuator and AvaCon, and this year is sponsored by University of California, Irvine, Institute for Virtual Environments and Computer Games, Rockcliffe University Consortium, and Virtual Outworlding together with a host crowdfunders. The conference this year once again features business presentations, talks, panel discussions, workshops, social events and hypergrid activities, covering a wide range of subject areas, including education, social VR, using virtual worlds and environments for historical recreations – and much more besides. You can find the full schedule of events on the OpenSimulator Community Conference website, together with instructions on how to log-in and join and of the sessions. The latter are also being streamed for those unable to attend via avatar. The 2016 OpenSimulator Community Conference (OSCC) will take place on Saturday 10th and Sunday 11th December 2016. An annual conference that focuses on the developer and user community creating the OpenSimulator software. Organised as a joint production by Core Developers of OpenSimulator and AvaCon, Inc., and sponsored by the University of California, Irvine, Institute for Virtual Environments and Computer Games, the conference features a day of presentations, panels, keynote sessions, and social events across diverse sectors of the OpenSimulator user base. The Conference for 2016 will feature a series of dynamic short presentations and panels that spotlight the best of the OpenSimulator platform and community, and a Call for Proposals has been issued to individuals or groups who are shaping the Metaverse. The focus for the 2016 event is the visions for the future and the evolution of the platform, with 20-minute sessions available for speakers, while community-sponsored tours, content give-aways and Hypergrid explorations take attendees to far away places. The organisers encourage presentations that span current innovations and activities, performance artistry, educational simulations, innovative business cases or have a publication or track record of real world use. All proposals should be submitted using the conference Proposal Submission form, and any questions direct to the conference organisers. November 19th, 2016: presenter Orientation & Training sessions to prepare speakers for the conference and to set-up Presenter Booths. Any custom content, props, and audio-visuals must be submitted to be included in the conference programme. 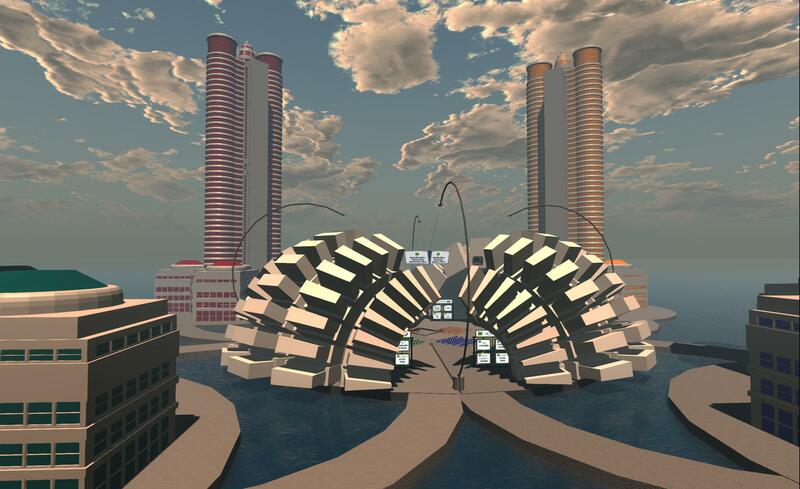 December 11th, 2016 – OSCC Hypergrid tour and other community events. A key part of OSCC is the social events held in the run-up to, and around the dates of, the conference itself. Those interested in running / hosting a social event should complete the Community Events Sign-up page. There will also be limited available space on the OSCC conference grid for those who would like to host an OSCC meet-up or an after conference event on Sunday, December 11th. Please contact the conference organisers. with any questions. On Thursday, October 29th, I received an e-mail announcing that registrations for the 2015 OpenSimulator Community Conference are open. Attendance is free, but for those wishing to donate to the supporting this and future conferences, there are a number of options to do so, ranging from $10.00 USD through to $200.00 USD, all of which offer various benefits to purchasers. For the full range of ticket options and their respective benefits, and to book your place at the conference, please visit the conference ticket page. The 2015 conference will be a one day affair, taking place on Saturday, December 5th. Nevertheless, it will present a full programme of dynamic short presentations and panels that spotlight the best of the OpenSimulator platform and community that will take place virtually on the conference grid. In addition, the organisers are inviting the OpenSimulator Community to host community and social events, scheduled for dates leading up to the conference in the days leading up to the conference and immediately following its closing on Saturday, December 5th at 17:00 PST, and again on Sunday, December 6th. Those interested in hosting a social event should register their interest via the Community Event Sing-up page. If you wish to give a presentation or talk at the conference, please register your interest via the Call for Proposals page, but note that all proposals must be received no later that 11:59 PST on Saturday, October 31st. Volunteers for the event can also sign-up via the Call for Volunteers page.